Based on Alibaba Cloud infrastructure, Alibaba Cloud Elastic High Performance Computing (E-HPC) is an end-to-end public cloud service. E-HPC provides individual users, education and research institutions, and public institutions with a fast, elastic, and secure cloud compute platform that interconnects with Alibaba Cloud products. E-HPC provides flexible configuration options and allows you to create ECS or EGS computing clusters with ease. The service is ready for use on purchase. E-HPC dynamically increases or reduces computing nodes in the cluster. The performance is not limited by the capacity of a single physical server. The service provides highly secured multi-tenant segregation to meet high availability and data security requirements. E-HPC can be seamlessly integrated with other products and services of Alibaba Cloud through the user console. Industry-leading Skylake CPU and Pascal GPU are used. You can create HPC clusters in the cloud as required. E-HPC can eliminate job queue times and automatically scale nodes and specifications to suit business needs. Provides HPC software to cover most user needs at multiple levels, including operating systems, cluster management, task scheduling, and industry applications. 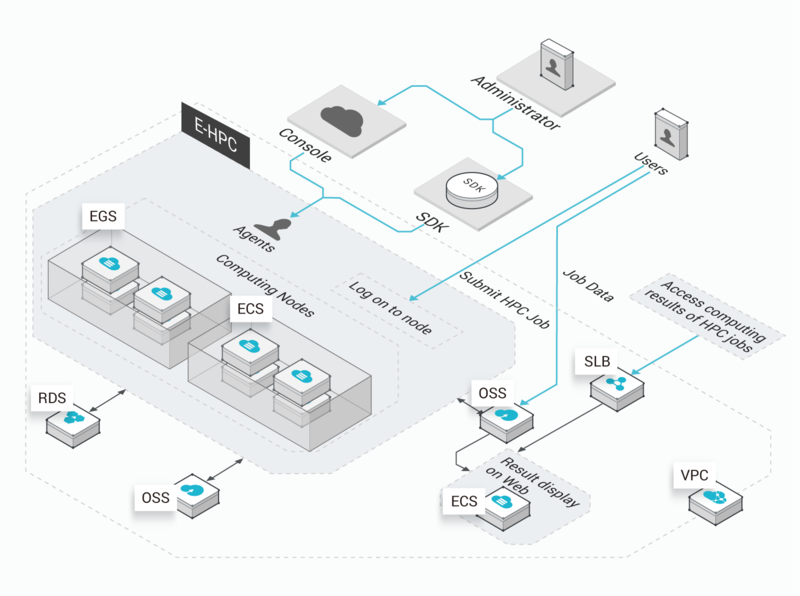 You can use Alibaba Cloud ECS, EGS, VPC, and NAS instances to build parallel computing clusters and dynamically adjust the nodes and the storage of the clusters as needed. Once you create an E-HPC cluster instance, the ECS, EGS, NAS, and related RDS and OSS services immediately become available with the cluster. You can create clusters according to the early cluster scale and dynamically scale the number of clusters when running code. You are not affected by the limits set by on-premises physical clusters. The data center infrastructure management (DCIM) and data segregation are secured by the native ECS, EGS, and VPC features of Alibaba Cloud.